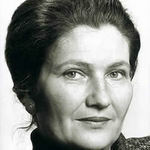 Women who Changed the World - "for Rebel Girls"
Simone Veil, DBE (born 13 July 1927) is a French politician and attorney who served as Minister of Health under Valéry Giscard d'Estaing, President of the European Parliament and member of the Constitutional Council of France. A survivor from the Auschwitz-Birkenau concentration camp where she lost part of her family, she is the Honorary President of the Fondation pour la Mémoire de la Shoah. She was elected to the Académie française in November 2008. Veil was born Simone Annie Liline Jacob, the daughter of a Jewish architect in Nice, Alpes-Maritimes, France. In March 1944, Veil's family was deported, Simone, her mother and one sister to Auschwitz-Birkenau then Bergen-Belsen where her mother died shortly before the camp's 15 April 1945 liberation. Veil's father and brother also died; they are last known to have been sent on a transport to Lithuania. Veil's other sister who had been arrested as a member of the Resistance survived her imprisonment in Ravensbrück. Veil returned to speak at Auschwitz-Birkenau in 2005 for the 60th anniversary of the liberation of the camps. Having obtained her baccalauréat in 1943 before being deported, she began the study of law and political science at Sciences Po and Pantheon-Assas Paris II University, where she met her future husband Antoine Veil. The couple married on 26 October 1946, and have three sons. Veil became an attorney and worked for several years as a civil servant in the Ministry of Justice.